You know when you notice something for the first time and then it starts popping up seemingly everywhere? Some call it the blue (or red) car syndrome, but it was first identified and labeled the Baader-Meinhof phenomenon back in 1994. Stanford linguistics professor Arnold Zwicky calls it “frequency illusion” and it’s caused by two psychological processes. The first, selective attention, kicks in when you’re struck by a new word, thing, or idea; after that, you unconsciously keep an eye out for it, and as a result find it surprisingly often. The second process, confirmation bias, reassures you that each sighting is further proof of your impression that the thing has gained overnight omnipresence. In the last three months we’ve been awash in news about organizations, regions, states, and even entire countries struggling with the problem of having more jobs than the people to fill them. We saw enough to write about the War for Workers about a month ago. That’s the current unemployment rate, as reported by the Bureau of Labor Statistics. That’s less than the 5.0% figure economists say represents “full employment” in the county. It’s been at 5.0% or lower since September 2015 — a period of 30 months and counting. The worker shortage is real, and the frequency of stories about industries, regions, states, and others not finding enough workers for the jobs available is not an illusion. It’s confirmed. It’s a significant issue for all. What’s worse is that it isn’t going to improve any time soon. The latest estimates from the BLS predicts the size of the U.S. labor pool of those ages 16-54 will remain essentially flat from 2016-2026. For those of you thinking immigration can help need only look at the way the wind is blowing in Washington. Don’t count on an influx of new workers. The only bright news is that the pool of workers over the age of 55 will increase as Boomers age into that segment. The youngest Boomers are turning 54 this year. 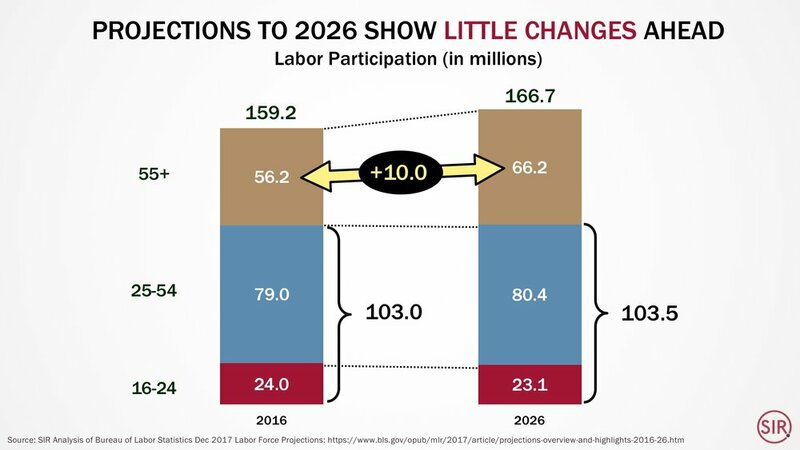 The projected increase of 10 million older workers can help. But, and it’s a big BUT…is your organization even considering adding more older workers to meet the shortfalls? Most are not. Many should. The key takeaway for all of these news stories about worker shortages is simple: If your organization or region expects to grow, you’ll need workers. And to get workers you’ll have to take them from someone else. Make sure you've got a compelling story for potential workers. It needs to be clear, concise, and unique. Everyone should know it, and it should be evident in everything you say or do when it comes to finding talent. Align your work culture with today. In other words, your culture should not reflect how you operated five or ten years ago. It's 2018. Workers expect your organization to operate as if it is. Offer basic benefits that are perceived as unique or better than what your competitors offer. Identifying what those are takes some work, but it's important. This talent problem is not the Baader-Meinhof phenomenon. It’s not a tomorrow problem. It’s a today problem and needs addressing now. Need a speaker at your next event? Hire Matt or John to share data-driven insights on the future we already know.